A hundred years ago, Uganda was branded the Pearl of Africa. Wildlife of every kind could be found in abundance. Then in the 1970s, the dictatorship of Idi Amin followed by years of civil war saw a rise in poaching that took many species to the edge of extinction, gorillas included. 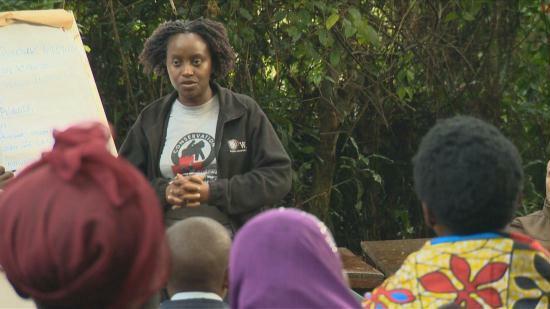 With less than 1000 mountain gorillas in the world, Gladys Kalema from Uganda, a veterinary scientist and founder of Conservation Through Public Health (CTPH) decided to take care of the fierce looking but calm animals. “It’s very appealing to work with gorillas because saving a critically endangered species you prevent it from going to extinction and it’s a priority.” Gladys says. The first contact Gladys had with themountain gorillas she had gone to work on a species of her own choice in Bwindi one of the impenetrable forests in Western Uganda. “That’s when I fell in love with the gorillas and gorilla conservation. They are very similar to us.We share over 98.4 per cent genetic,” she says. Gladys and her team often track gorillas in forests to check their health and ensure there’s no human threat near them. They follow the trail on the ground left by the gorillas to track them. Gladys Kalema from Uganda pointing to an excrement of a gorilla in a nest. To check the health condition of gorillas, Gladys and her team test the excrement. To determine the health of the gorilla, they take a sample of gorilla excrement found in the nest and test it. “Gorillas build a nest every night then they move an average of a kilometer per day and build another nest. In the nest you find many surprising things, sometimes you find blood in the nest andyou know that this gorilla could be sick. Sometimes they’ve given birth and you find blood. So it’s very important to reach the nest every day,” she explains. Tracking gorillas is a small fraction of Gladys’ work. Next to Bwindi forest, CTPH reaches out to the local people, convincing them that healthy gorillas bring a better way of life to them.Instead of hunting gorillas and clearing the forest, keeping gorillas safe generates more income from tourism. Gladys holding a training session. Gladys and her team educate the local people living near the forest about the importance of conserving gorillas. Gorillas have to be kept safe from human infection. Humans should keep a 7 meter distance away from gorillas not to transfer any diseases to them. So CTPH campaigns vigorously to improve hygiene among nearby people, preventing the spread of tuberculosis, scabies and dysentery. The number of gorillas has increased from 300 to 400, thus showing the success of conservation work done by Gladys and her team. Bwindi forest thicket, at the far off Gladys and her team crossing a water stream. They are tracking gorillas. Gorillas only have babies once every 4 to 5 years. As a leader Gladys sets her own example. 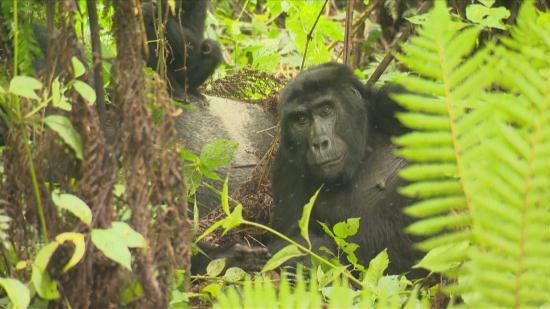 With just two children of her own, she’s been careful to space them four years apart, just like the gorillas of Bwindi. “I space my children like they do.So Indigo and Tendon are four and half years apart. If we did this as humans, the world wouldn’t be so overpopulated,” says Gladys chuckling.